Research may provide a way to coax mites to leave homes on their own. Common dust mites in the home are not actually insects at all. Instead, they belong to the class Arachnids -- which includes spiders and the subclass acarina that includes ticks. 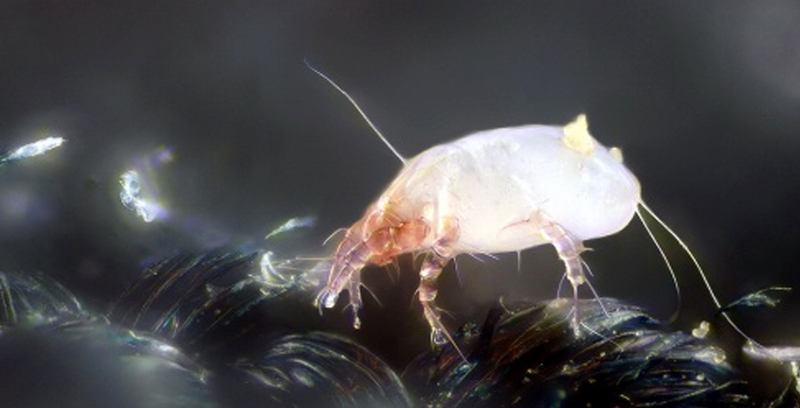 (ISNS) -- House dust mites, nearly microscopic creatures that inhabit every crevice of our lives and make us sneeze, have long been assumed to be solitary in behavior. Now new research has shown that they are actually quite social. A group of ethologists -- animal behaviorists -- have demonstrated that these mites migrate through our homes in crowds. They like the occasional communal road trip, and they follow each other using some signal, perhaps chemical, to choose the route more traveled. The BBC's online Earth News suggested house dust mites were one of the deadliest animals in the United Kingdom, because of their propensity to instigate severe allergic reactions, such as asthma. "If we know the mechanism behind the mite's migration, perhaps we might be able to control them," commented Audrey Dussutour, a research biologist at University Paul Sabatier in Toulouse, France. Dussutour studies social behavior in ants and collective action in slime molds and was not involved in this dust mite research. For ethologists, though, the value of this research is in finding the essences of behavior. While these mites have nowhere near the social complexity of ants and termites, they may be able to provide clues about the origins of those relationships. Mites are not insects. They belong to the class Arachnids, which includes spiders and the subclass acarina, which includes ticks. Long believed to be solitary animals in general, several species of spiders and one species of mites, spider mites, have been shown to cooperate within species groups in building nests and raising young. This is the first evidence that house dust mites share some rudiments of sociality. "Sociality has seldom been studied in acarines [mites and ticks]," said Aina Astudillo Fernandez, co-author of the paper appearing in the journal Ethology and Ph.D. candidate at Universite Libre de Bruxelles in Belgium. "It is fascinating to see that sometimes the mechanisms underlying the behavior are shared by many organisms." In the experiment, researchers placed mites in one of two arenas in a petri dish, with connecting paths. They then put a tiny dish of water in one arena. The mites migrated towards the more humid arena, the one with the water. The adult mites traveled about 130 micrometers -- slightly more than the width of a human hair -- every second. Males and nymphs were more likely to move than females and larvae. The researchers then gave the mites a choice: they could travel to the humid arena via two equal routes, one to the right, one to the left. At first the route a mite would take would be random -- as predictable as a flip of a coin. But by the end of the experiment, the mites were predominately choosing one route over the other. This pattern fit with a mathematical prediction model suggesting that mites preferred going where some mites had gone before. How the mites could sense the paths of their predecessors is not yet known. "Perhaps they leave traces such as molecules from their cuticles, or maybe even actively secrete pheromones," said Astudillo Fernandez. "If this were the case, identifying the signal could provide a key to lure them out of our beds." Cynthia Mills is a practicing veterinarian who has written mainly about animal issues for the magazines Discover, Scientific American and Conservation, as well as the book "The Theory of Evolution," what it is, where it came from and why it works.